Description: Stock Photo of a Man and a Boy With Their Dog On The Beach. 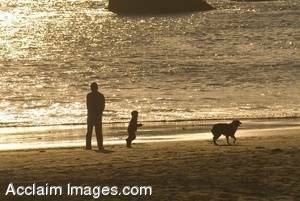 This photograph shows the people and dog in silhouette with the sun reflecting off the ocean. The picture was taken at Harris Beach in Brookings, Oregon, October, 2005. This photo is available as an art print or poster and may be licensed as stock photography.